1. Capcom (Creators of M.E.R.C.S.) 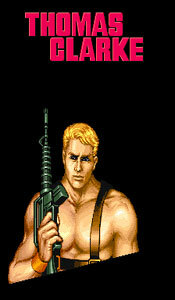 - The makers of the world's classic shooter games. Click here! 2. Mame (Multiple Arcade Machine Emulator) - Thanks to the work of these talented programmers, thousands of classic games, left to collect dust and disappear, have been restored to work again on pretty much every computer system in existence. Thanks for the incredible job you have done in saving the beginnings of video gaming for future generations. M.E.R.C.S and others will still be great games, no matter how 3D the future games are. If you still have not experienced the Mame Program, please visit them at once. Click here! 3.. Retrogames - In my opinion, the best emulator news site. Also the gracious host of my tribute pages. Thanks again, Retrogames! Click here! 4.. The Arcade Flyers Database - A link to this site for allowing me to take some of the flyer pictures in their database for use with my M.E.R.C.S webpage. They deserve the credit for collecting and restoring thousands of arcade posters, pictures, and flyers. Click here! 5. This site is an "Emulation Brother". 6. Arcade Forever! - I found this website browsing the internet for Rampage (game by Bally-Midway) stuff. To my surprise, this site had numerous "playing guides" (basically complete sites about) of various games (Rygar, Black Tiger, Double Dragon and more!). Check this page out! Click here! 7. The Ghoul Realm - Well, it had to happen. Another GNG related page. It looks like my page has spawned interest in this great series. This page seems to focus on ALL versions of GNG and even some of the GNG related games like the Gargoyle's Quest series (I didn't even know there was a third Gargoyle's Quest, Demon Crest!). Check it out!